Bug and Oysters.. why not? Came across some old pictures... so not sure if I shared this before, but after the really great cruise to Bivalve NJ quite a while ago, as people were departing from the Bayshore Center after the tour, Ted and I took a left out of the parking lot to see what was around. What we found were small mountains of oyster shells.. incredible! When in one's life going to see something like this in person?!! So we drove closer to investigate. Before I drove further down the area, Ted bailed out to take some pictures.. which came out ok. So, I drove down much farther, trying to get a good perspective shot, and parked...soon after seeing a huge number of seagulls, I was worried about getting bombed on especially in a convertible -I thought I should get out of here sooon! Ok, to be truthful, besides the birds, the stench of millions of oyster shells was so overpowering, and after the birds...the swarm of flies were just scary.... those flies looked HUGE, you could see their face, and they looked mean.. One landed on my hood so seemingly hard thought there was going to be a dent. Needless to say, I got out of there real, real fast going through puddles, crunching and spitting up shells..
....Well, if the world is my oyster, ....I don't want it! Incredible, all of that is oyster shells!!! Re: Bug and Oysters.. why not? Great photos Matt! You never know what you might find driving around like that, thanks for showing the pix's/ When you think they would ship out 35 Box Cars of of thoses slimey things every week that explains the large piles. That's what you get for not following directions!!!! That area actually has a Name and is on the Map.. It's Called Shell Pile as is the Town or Simply Shellpile..
Back in the Day "which are days gone by that only Jack" can recall.. No one had stone paved driveways.. Everyone including business etc had Shell paved driveways and many still do.. After all when in it's peak the area was shipping 70+ box cars a day of Oysters out of that region and that's 70+ Box cars of mostly shucked/shelled Oysters which compacted easier for more profits. 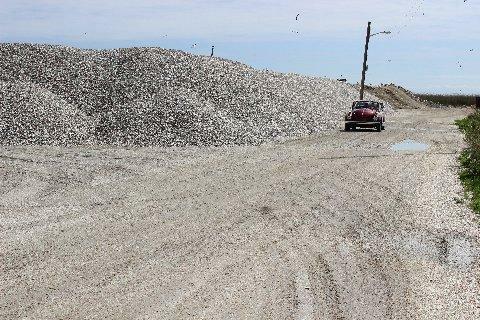 So that left Huge Plies of Shucked Oyster Shells to dispose of and those Shells paved many of the Jersey Shore Areas summer homes and business.. This area also had more Millionaires then any place in the Sates and was said to be common to see the owners etc lighting their cigars with $100 Bills. 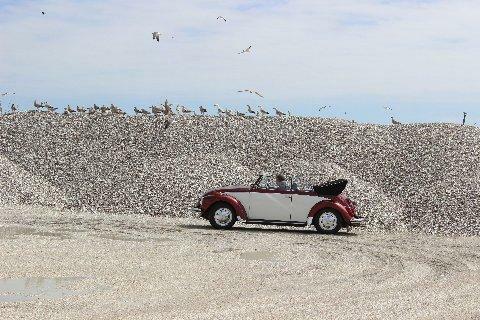 Even into the 60's when we use to fish that area I remember seeing huge Piles of Bleached White Oyster Shells in that area and it wasn't just one pile the piles were scattered all over the area or wherever they could dispose of the shells. When we last had our Guided Cruise to this area Hosted by Paul Hettinger who's family name still looms on the docks.. We passed and saw much of this lost History..
That's fascinating, Jay! Thanks for sharing!! Thanks Jay.... still too many oysters for me.